Gather your tribe of bikers and select a bucket-list biking adventure for you and your group. Don't need help planning a retreat? We are teaming with biking enthusiasts, shop owners, and community leaders. The ones who find every great ride and bring everyone they know with them. Trip Tribe spent months finding the best bike trips: down the California coast, through the Costa Rican jungle, across European countrysides. We're now looking for Biking Ambassadors whose only responsibility is to find a trip and bring at least 5 people with them. Set-up your trip in minutes. 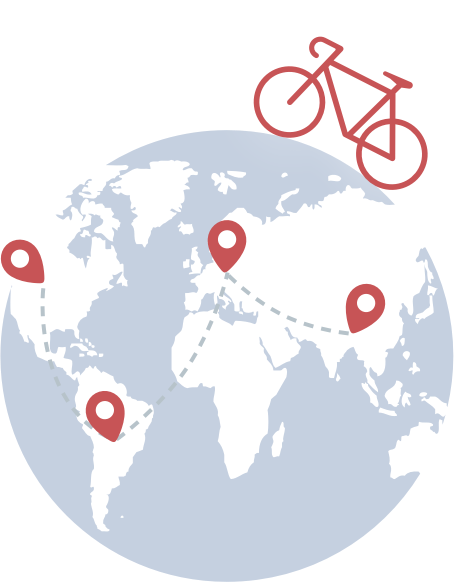 Select from curated biking itineraries from all over the world with our unique planning tool. Handling payments and customer service is freaking hard. That's why Trip Tribe instantly generates your own trip page where guests can easily book and ask questions. Decide how much you want to make for each guest you bring with you. Bring 5 or more, and earn a free trip package. Yes, really! No deposit, no fees. All you need to do is get 3 people to book within 45 days of launching your trip (or we'll cancel it at no cost). I was always apprehensive about booking on my own as a retreat leader. But they make it so easy for you, as a teacher, to focus on teaching and they take care of the rest! I could not ask for a better overall experience." As a Trip Tribe ambassador I can honestly say that this was the most fulfilling experience I have ever had in my entire life. I gained more leadership experience on this trip than I could have ever imagined." Leading [our] retreat ... was one of the most incredible trips I've ever been on... Trip Tribe took care of organization, so all we had to do was bring our yoga classes and lead the fun!" As a Tribe member, you get exclusive access to our unique biking trips before they sell out.